ARROW: Season 3 Episode 10 Review - Left Behind | Warped Factor - Words in the Key of Geek. 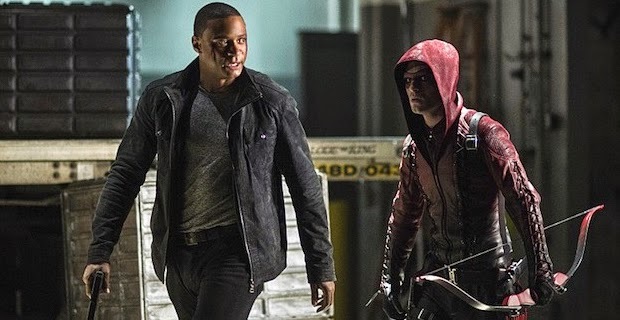 Brad Wilson checks out the midseason premiere of Arrow season 3. Our favorite vigilante gang is back! “Arrow” has returned from the winter break and with a new trajectory: Ra’s Al Ghul has Malcolm Merlyn on the run, Laurel Lance has become Black Canary, Oliver Queen is still alive (shocker) and everyone is still lying to each other - at least that hasn’t changed. This episode was a little mild for me. Clearly Stephen Amell as Green Arrow is the heart of the show - It is called “Arrow,” after all. But I suppose the writers did need to do one show (mostly) without Oliver, before bringing him back. In the meantime, however, the suspension of disbelief this show requires was stretched a little in this episode. As far as everyone knows, Diggle, Felicity, Roy, Malcolm, Laurel -- Oliver is dead. And yet, NO ONE thinks it’s time to come clean with Thea. I understand why this would completely derail the plot and would dissipate the tension caused by all the lying and deceit, but as I said, it’s getting a little ridiculous. Speaking of Thea, it’s still too weird seeing her “train” with Merlyn. I’m actually a little disappointed Oliver wasn’t brought back by using the Lazarus Pit. I have to imagine that particular plot device will show up eventually since we do have Ra’s Al Ghul, but I’m bummed it wasn’t now. I guess the writers thought it too convenient? Either way, I am very interested to see what Tatsu Yamashiro did to bring him back. I mean, the guy was run through with a sword and thrown off a mountain. What could she have possibly done inside that snowy mountain hut? Again, suspension of disbelief. Now, let’s talk about this Brick character. What in the world is this guy? Diggle shot him right in the head and he barely flinched. Something is amiss here, but I’m intrigued. He seems like a fun mid-season villain for the team to handle before Ra’s and The League of Assassins comes back. Though, it’s getting a little tiresome seeing every bad guy on this show trying to do something to The Glades though. Merlyn wanted to destroy it, and now Brick wants to rule it. Don’t they know there’s so much more out there? I guess if it’s not broke don’t fix it. I’m still wondering how Ray and his A.T.O.M. suit fit into all this. I never read any Green Arrow comics, and I think that’s a good thing for reviewing a TV show about him. Ray has his own motivations, which Felicity so eloquently called him out on. A very poignant moment in the show, by the way. Really nice acting in that scene. His involvement in Team Arrow seems inevitable as he is a pretty stand-up guy. Overall, I’d give this episode a solid B. Decent action with some really nice acting scenes. Laurel as Canary seems laughable to me, not only because the character has nowhere near the training required, but also because Kate Kassidy’s acting is just a little suspect. I’ll be glad when Oliver rejoins the team!